Key West party boat fishing. Full Day and Half day Trips departing daily From Key West, Florida. Party boat fishing in Key West is without a doubt the most affordable way to get on the water and go fishing. 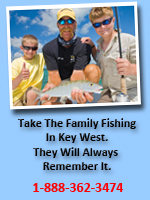 Per person head boats take you out to the reef for a minimal fair and show you a great time fishing for Key West reef species such as grouper, snapper, mackerel, kingfish, tuna, sharks and more. Take some fish to a local restaurant and have it cooked up. Go alone or with some friends and have a ball. We offer 6 hour party boat trips here in Key West departing daily. Fun and safe for all ages and all skill levels are welcome. Rods and reels are included in the trip fare but you can also bring your own. We also offer private charters on the Key West party boats too. Bring your group and have some fun fishing your own private tournament or just a fun days outing. Our boats have snack bars and clean bathrooms for your groups needs. Pricing depends on group size and duration of charter. Please call for more info. 1-888-362-3474. Also check out our Split / Shared Charters for Deep Sea Fishing. 65 Ft party boat with ultra wide beam. Departs from the heart of Key West daily at 10 am and returns at 4 pm. Rate includes fishing tackle, licenses and bait. Beer and snacks are available. It is customary to tip the crew 20%, providing you feel they did an outstanding job. The crew will clean your fish when the boat returns to the dock for .50 per fish. 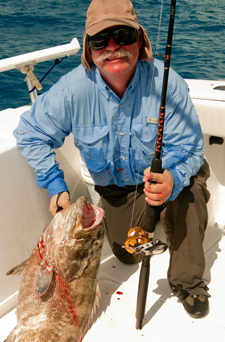 Check out our Reef and Wreck light tackle fishing trips in Key West. Private charters for 4 or less.